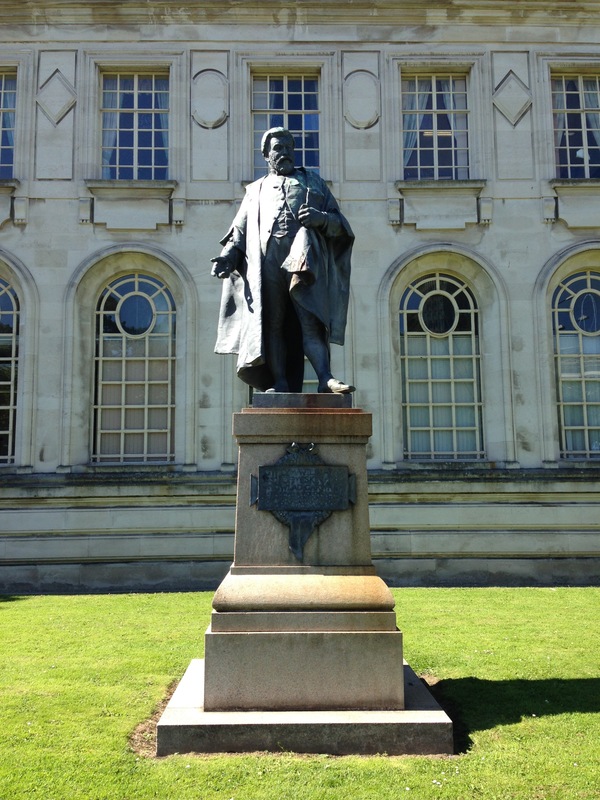 For my third UK public art collection visit I made my way to Cardiff. 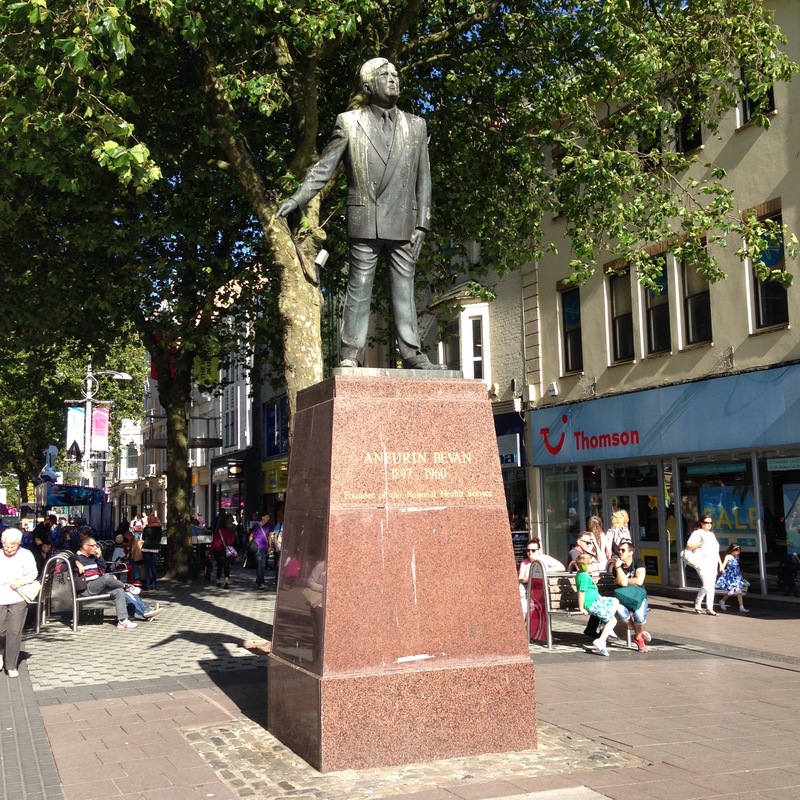 Cardiff Council speaks of having a collection of 200+ permanent public artworks. In contrast to Folkestone’s seven years of collecting the artworks in Cardiff range back over 150 years. 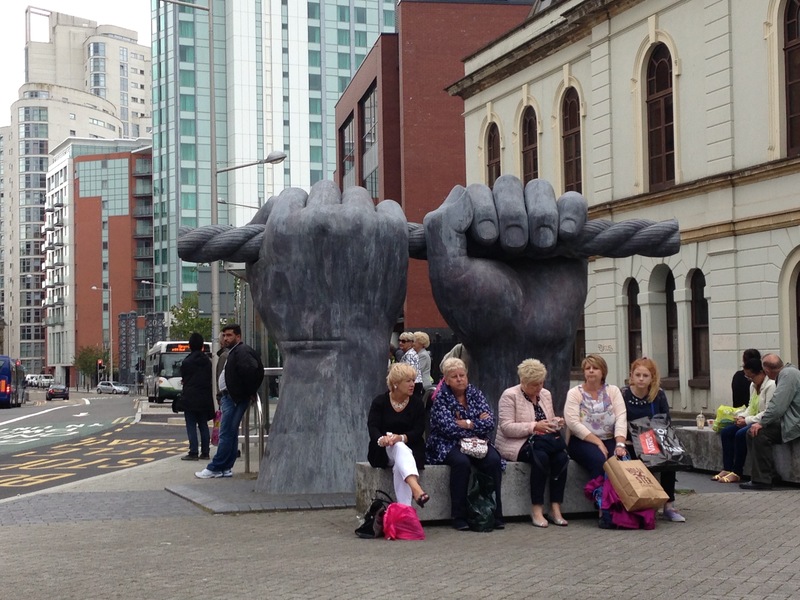 My first Cardiff public art encounter, seen as I crossed the road from my hotel en route into the city centre, were two giant grey fists rising out of the pavement. Consulting the information I have brought with me I find that this is an artwork called ‘All Hands’ (by Brian Fell). Later I find out from the artist’s website that the sculpture is sited above a enclosed canal that was once was a coal supply route down to the docks. 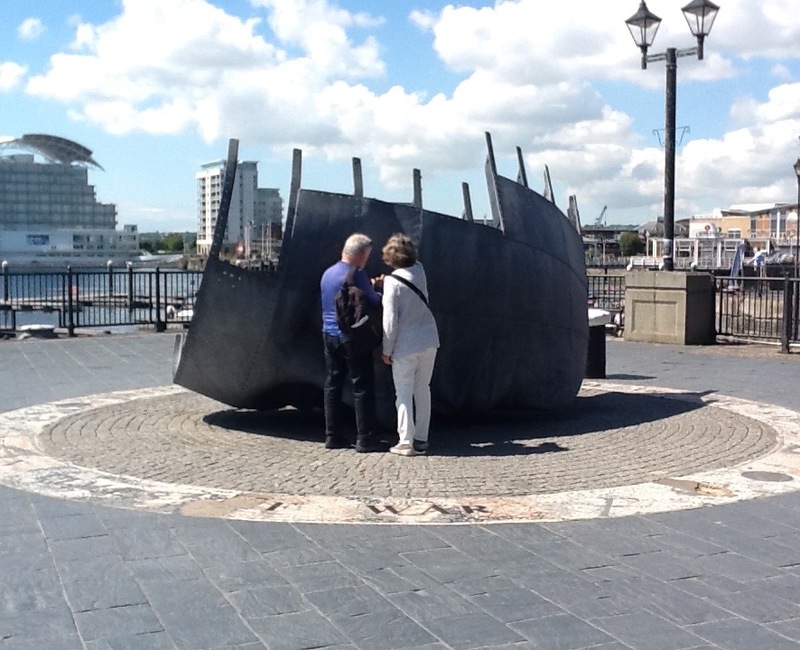 The artwork being intended as a commemoration to Cardiff’s dockworkers. But what I notice on the street is the way a small crowd of people has gathered on the seating set around the sculpture, not looking at it but facing away from it. As I walk round to the other side I realise that the sculpture is really close to a popular bus stop. I wonder if any of these waiting passengers are thinking about dock workers or are aware of the canal beneath them? The next artwork I come upon is sited in the pedestrianized area around the St David’s Shopping Centre and immediately outside the central city library. 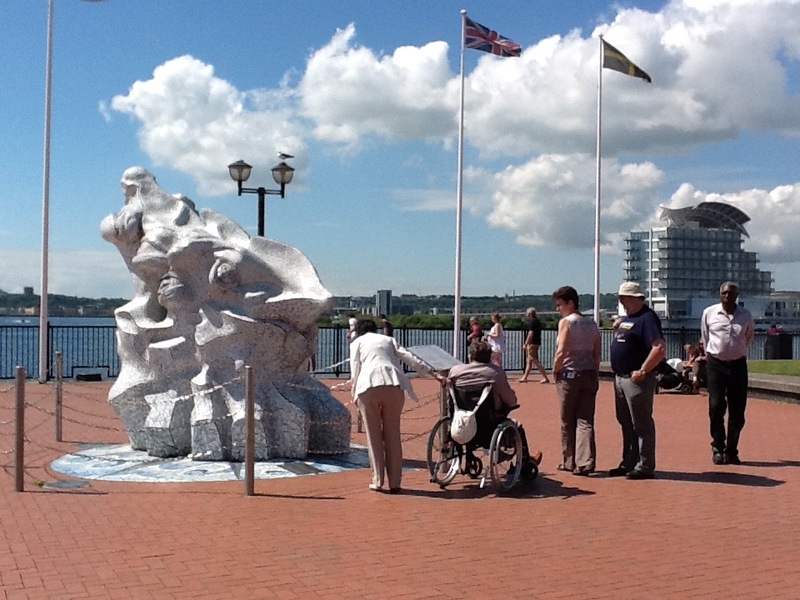 It is one of the newer artworks in the city, installed in 2009 as part of the St David’s Public Art Programme. It is certainly a big work (25m high) but it also has an ambitious aim. 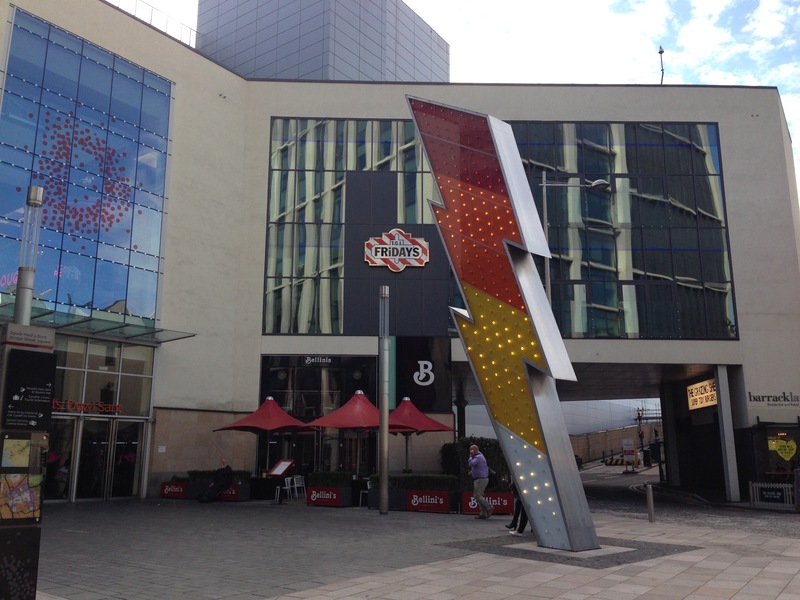 According to a plaque inlaid into the pavement nearby, ‘Alliance’ represents ‘the meeting of past and present and a new symbol for the city’s future’. 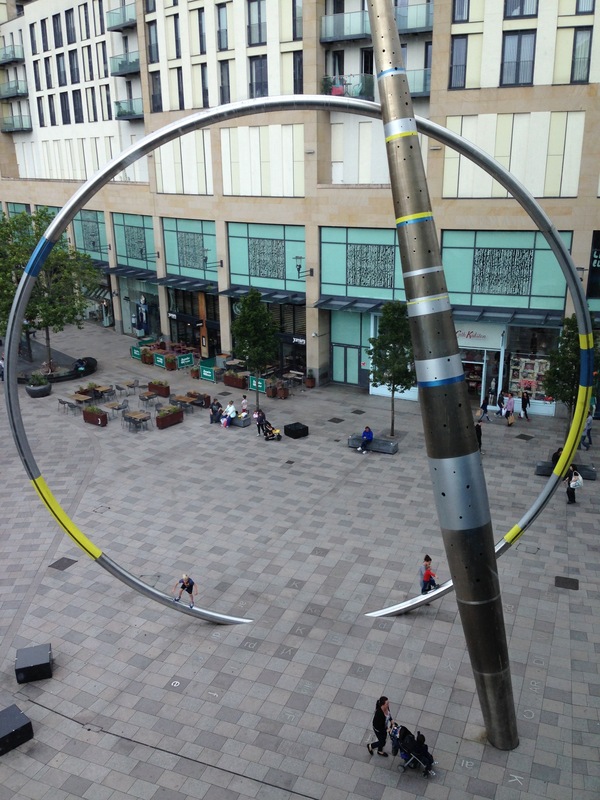 I learn later from my Cardiff conversations that this two-element sculpture is referred to locally as the ‘Hoop and Stick’. It’s a good description. The Wikipedia entry for ‘Alliance’ states that the hoop is filled with a liquid that is programmed to rise and fall to mark the changing tide on the Bristol Channel (an intriguing detail, if this is still working). I go into the library to get a different view of the artwork and the public space around it. Looking down I watch the movement of people passing under the ‘hoop’: from what I observe it seems an irresistible climbing challenge for some young children. 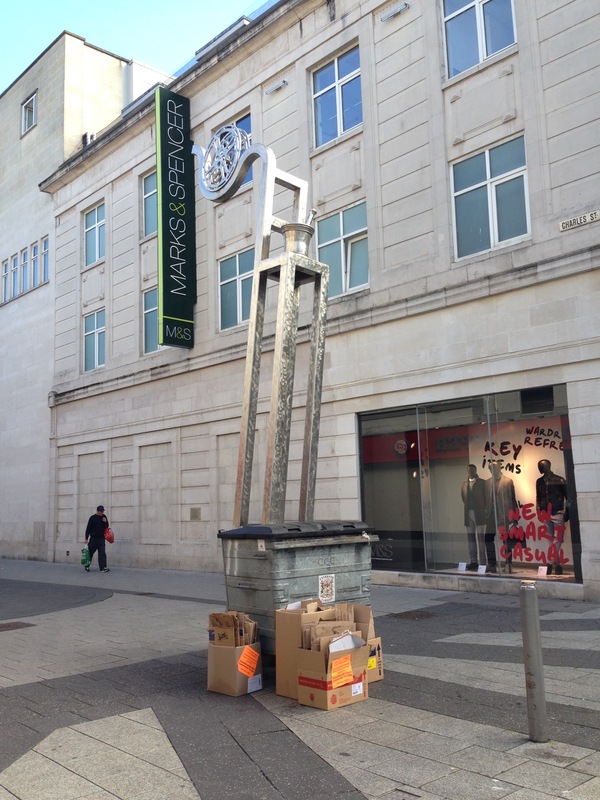 ‘Alliance’ or the ‘Hoop and Stick’, outside Cardiff Library (Jean-Bernard Metals, 2009). 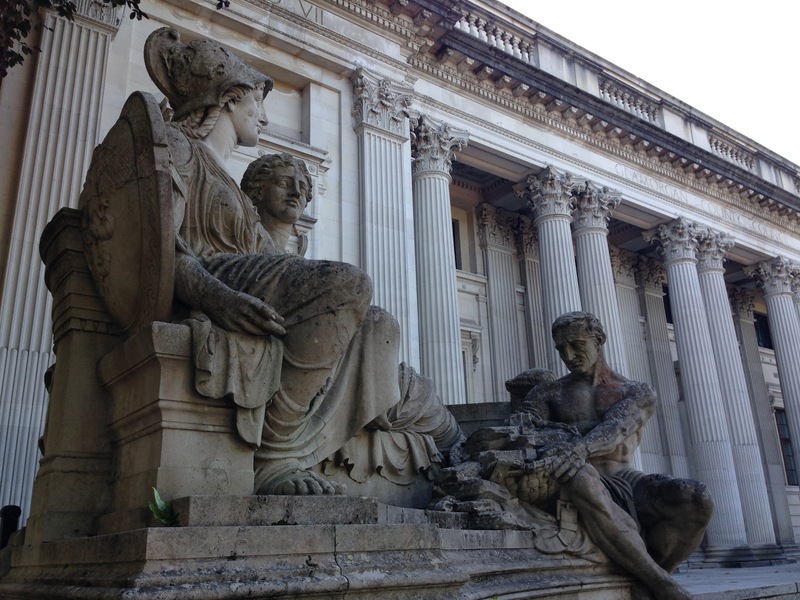 These two works are my first introductions to the Cardiff public art collection. Over the next day or so of my visit I explore the city and its artworks further, focusing especially on the three areas mapped out in the walking tour maps sent to me by my contact in Cardiff Council: the city centre, the historic ‘Civic Centre’ and the redeveloped waterfront at Cardiff Bay. Just looking at the maps you get an idea of how different these three areas are spatially. 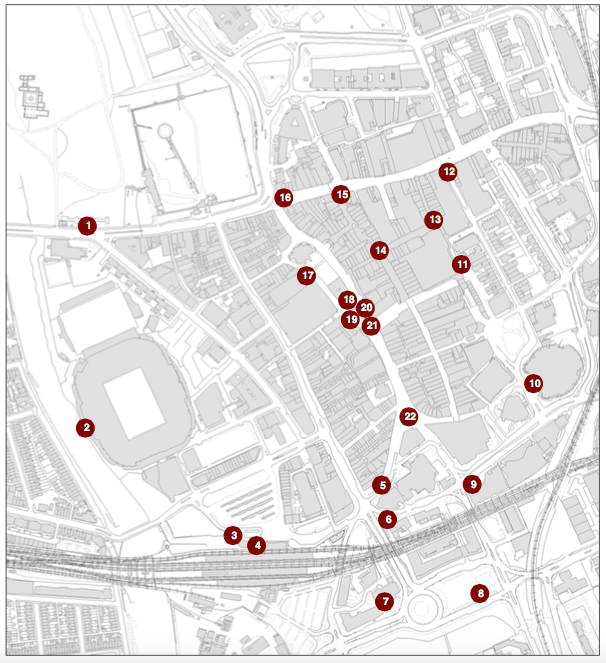 The city centre map appears to shows its collection of artworks as inserted into a tightly packed streetscape, spread out in a string along the high street or marking significant street corners. 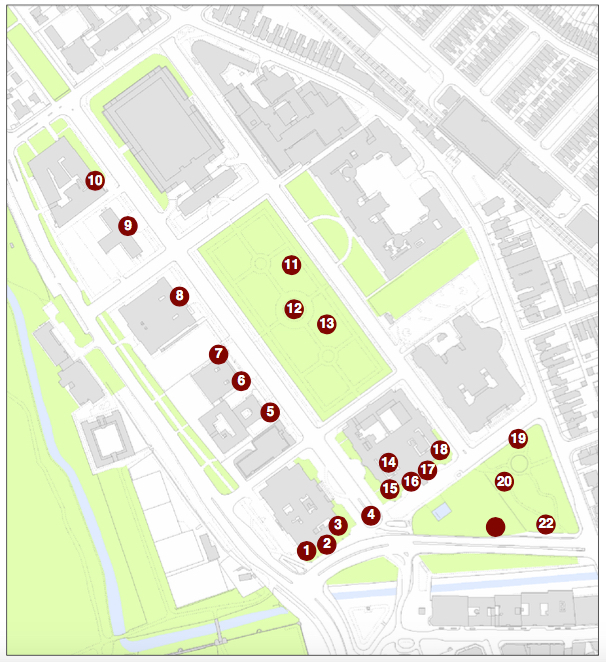 The Civic Centre map meanwhile indicates a much more planned arrangement. 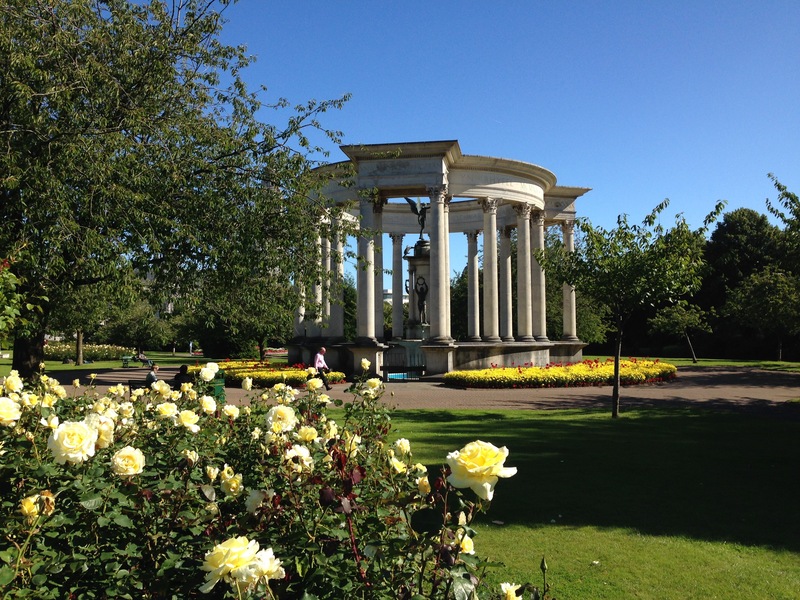 Here the artworks are part of the mid 19th-early 20th century architectural design of the grand civic quarter, embellishments of the buildings themselves or set out as formal statues and memorials in the surrounding green space. 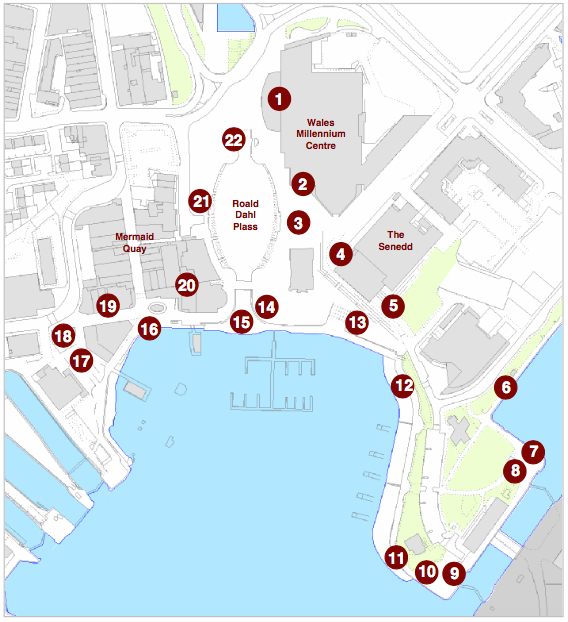 The Bay map plots its own artwork collection against the blue and open backdrop of the waterfront and around Cardiff’s contemporary architectural symbols, the Millennium Centre and the Senedd (Welsh Assembly). ‘Without Place’, Charles Street (Denis O’Coner and Bernie Rutter, 2011). Gonçalves, A. & Thomas, H., 2012. 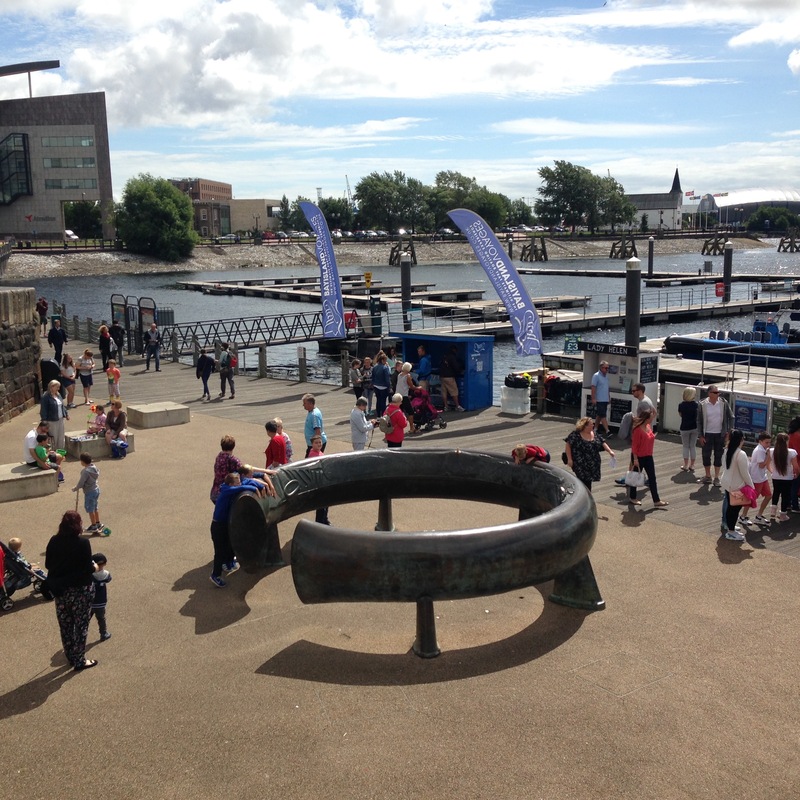 CASE STUDY: Waterfront tourism and public art in Cardiff Bay and Lisbon’s Park of Nations. Journal of Policy Research in Tourism, Leisure and Events, (August 2015), pp.1–26. Hall, T. & Robertson, I., 2001. Public Art and Urban Regeneration : Advocacy , claims and critical debates. Landscape Research, 26(1), pp.5–26.